It’s the summer of 1966 and high school freshman Kaoru Nishimi is struggling to adjust to the latest of many moves in his young life, this time to his uncle’s home in the seaside town of Kyushu. It’s never easy adjusting. But this time will be different. This time he’ll meet friends who’ll change his life forever. And he’ll discover a new passion, one that grabs his heart and rocks him to his very soul. It’s called JAZZ, and together with bad boy Sentaro and music store girl Ritsuko, they’re going to follow their muse to wherever their music takes them! 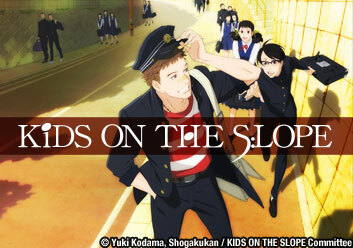 Get ready to be blown away as the acclaimed team behind COWBOY BEBOP reunites for a tale of life, love and all that jazz in THE KIDS ON THE SLOPE! Kaoru hates moving from Yokosuka to Kyushu, since it means leaving all he's ever known for a new place where the accent is so thick he can barely get by. A run in with local thug Sentaro changes everything, to the tune of a new friend and interest. For Kaoru, Ritsuko is just as interesting as his new found love of jazz. A meeting with a trumpeter that Sen idolizes leads to an impromptu jazz session, one that spurns Kaoru into asking Ritsuko out on a "study date". Sentaro has found a new love in Yurika, a sophisticated beauty who is a year older than him. Kaoru, ever the opportunist, arranges a double date with Yurika. Jun invites Kaoru and Sen to be part of a jazz quartet at a Christmas gig. The thing is, they only have one month to prepare. Kaoru becomes jealous of Sen for "having it all", and must come to terms with these new feelings. Kaoru finally gets a straight answer out of Ritsuko about their relationship, but is that what he really wants to hear? Kaoru travels to Tokyo to visit his estranged mother, and Sen tags along for the ride. Sentaro feels blue because he isn’t in the same class as his friends. 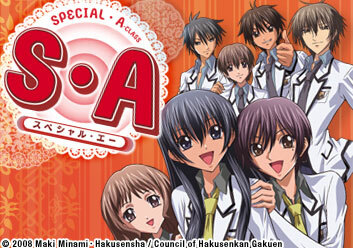 Sen forms a friendship with Seijii, which makes Kaoru jealous. The rift between Sentaro and Kaoru widens as they both fulfill obligations elsewhere. The school festival arrives and trouble comes with it. 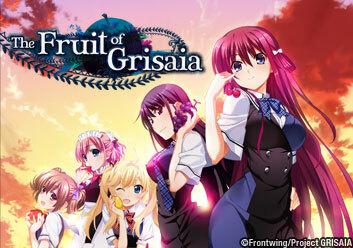 Ritsuko questions her feelings for Sentaro as his popularity with the ladies increases. Junichi tries to scare Yurika away, but her feelings remain steadfast. The labors of love prove to be both futile and fruitful. 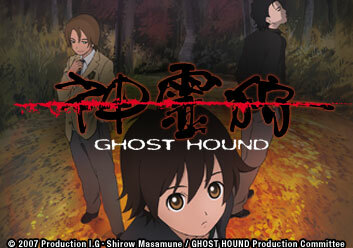 Sentaro and Junichi attempt to mend their friendship before Junichi leaves with a one-way ticket to Tokyo. 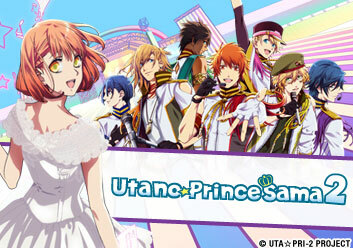 Sentaro finally realizes Ritsuko’s feelings for him, but it may be too late. Yurika begs Junichi to take her with him to Tokyo. There is something at stake for everyone: Kaoru and Ritsuko must confess their feelings for each other or risk not knowing happiness together, and Sen rides a fine line between passing and failing his sophomore year. Sen plans to run away, but there is someone waiting for him outside. The upcoming school festival has Kaoru and Sen stressed. An unforeseen event transpires and changes their lives forever. Graduation day has arrived, but Sen has yet to return. The question remains as to the state of Kaoru's and Ritsuko's relationship, and Kaoru hopes to play jazz with his best friend one last time.